A two-day jury trial has been scheduled to begin in Blaine County Magistrate Court on Jan. 22 in a misdemeanor DUI case against Sun Valley Assistant Police Chief Michael J. Crawford. In a new development, Ketchum attorney Brian Elkins, who represents Crawford, was successful this week in suppressing evidence regarding Crawford’s blood-alcohol level on the day he was charged with the crime. Following a court hearing Tuesday afternoon on Elkin’s motion to suppress, Judge Jason Walker ruled that the evidence is inadmissible at trial because police did not following standard operating procedures in administering the tests. Hailey police reported earlier that Crawford’s blood-alcohol level was about .18 when he was charged with the crime on Aug. 11. The legal blood-alcohol limit for driving in Idaho is .08. Elkins successfully argued that the test results should not be admissible because Hailey Patrolman Jeremiah Jones failed to have Crawford under complete surveillance for at least 15 minutes prior to administering the test. Further, Elkins pointed out that a “simulator solution” used in the testing process was beyond its expiration date. According to minutes from Tuesday’s hearing, prosecutors can still try to have the blood-alcohol test information presented to the jury if through expert testimony they can demonstrate to the court that the test results are still valid regardless of police not following testing protocol. Crawford, 53, faces the charge for allegedly backing into a parked vehicle three times on Main Street in Hailey. Jones, who was in his patrol vehicle, wrote in a probable-cause affidavit that he observed the accident and issued a citation after Crawford failed three field sobriety tests and tested over the legal limit in a breathalyzer test. 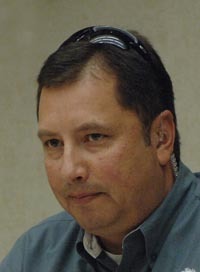 Crawford remains on active duty with the Sun Valley Police Department. In September, the Idaho Transportation Department declined to suspend Crawford’s driving privileges after Elkins presented evidence at a hearing regarding the violation of protocol in administering the breathalyzer test.